THIS STORY IS REPRINTED FROM A REPORT ON FRANCE 24, APRIL 1, 2015. 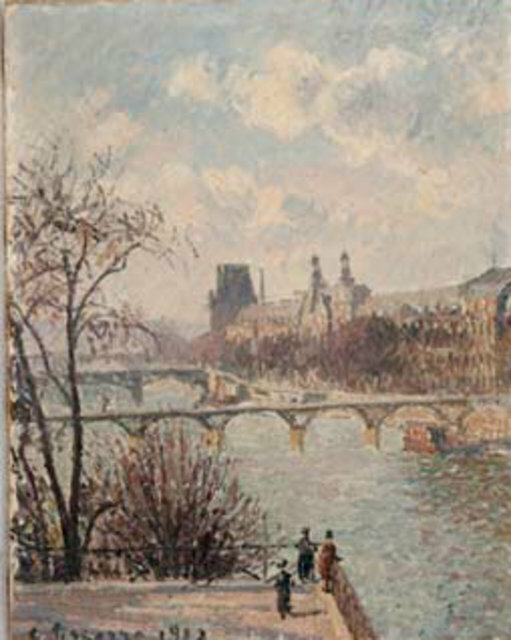 The painting shown above is taken from a news story at https://news.artnet.com/in-brief/nazi-looted-pissarro-discovered-in-gurlitt-trove-gifted-to-bern-188836, and matches information in the Pissarro Catalogue Raisonne (2005) for PDR 1418. BERLIN (AFP) – Germany said Wednesday experts had established a Camille Pissarro painting from the Cornelius Gurlitt art trove was looted by the Nazis and should be returned to the heirs of its rightful owners. The oil painting from 1902 entitled “La Seine vue du Pont-Neuf, au fond le Louvre” (The Seine seen from the Pont Neuf) is “absolutely certain” to have been looted by Hitler’s regime, the German culture ministry said. “For the restitution, we are already in contact with the heiress of the former owner,” Culture Minister Monika Gruetters said in a statement, without identifying the family. Research by a German government-appointed task force has already established that the artworks “Seated Woman” by Henri Matisse and “Two Riders on the Beach”, painted by Max Liebermann, should be returned to the heirs of their rightful owners.